"I love to order salt and pepper squid at our local Chinese take-out restaurant. I thought the spice blend would be fantastic on grilled chicken wings. I order the Szechuan peppercorns online and roast them as I need them. Don't worry if there is more spice blend than you need, it keeps for quite some time in a sealed container and you'll find yourself sprinkling it on a variety of different things." Roast salt and peppercorns in a dry skillet over medium-low heat until salt starts to turn yellow and peppercorns become fragrant and begin to pop open, 5 to 10 minutes. In the meantime, preheat an outdoor grill to medium-high heat. Brush chicken wings with peanut oil. Grill wings over indirect heat, turning occasionally, until juices run clear and an instant-read thermometer reads 165 degrees F (74 degrees C), 15 to 20 minutes. Place the salt and pepper blend in a mortar and grind with a pestle until coarsely ground. 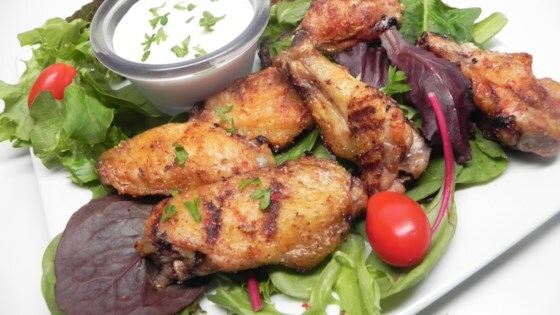 Place the grilled chicken wings in a large bowl. Sprinkle in 2 teaspoons, or more depending on taste, of the spice blend; toss to coat. Nutrition data for this recipe includes the full amount of salt and pepper coating. The actual amount of coating consumed will vary. These were pretty good and this is one I'd make again. I think the chicken could have used some seasoning prior to going on the grill so I will try that next time.